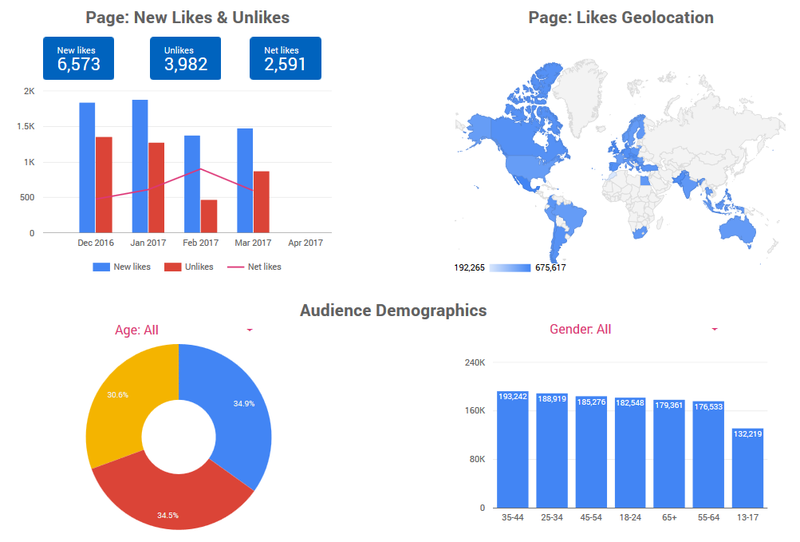 FACEBOOK INSIGHTS GOOGLE DATA STUDIO · 5-MINUTE READ · By Miguel Cedeno on May 29 2017. Facebook Insights is a great tool – it allows you to understand the performance of your Facebook Page. Perhaps more importantly, it also uses diverse metrics to help you improve your overall Facebook strategy. In the template we’re sharing with you in this blog post, you will be able to quickly understand how you can learn more about the people that like your page and the performance of your posts. 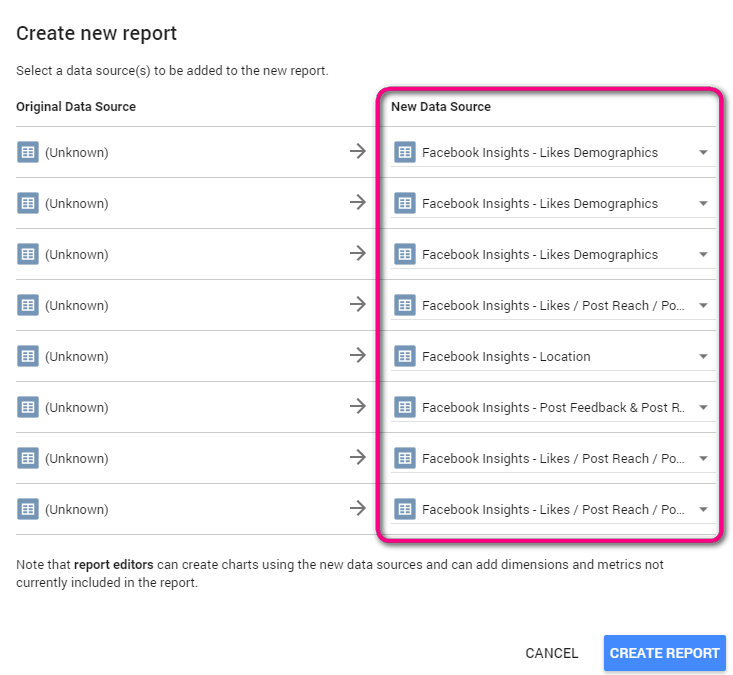 Previously I’ve focused on speed and talked about how to create the fastest report in Data Studio, this time we will use the help of Supermetrics to allow us import Facebook Insights Data into a Google Sheet quickly and efficiently. Facebook Insights allows you to view the total number of “new likes” that your page is getting each month. Moreover, you will be able to see how many “unlikes” your posts received, as well as the “net likes” (new likes – unlikes) for the same period of time. In the top right section of the image below, you will be able to understand which countries your Facebook presence is growing in. Additionally, you can discover the demographics of the audience that have liked your page. You can use the filters (in pink) to segment by age and gender simultaneously. People that Your Posts Reach: If you launched a campaign on paid or organic channels, and you want to know which channel has contributed the most to your total posts reach, you can visualise that too. Additionally, you can learn if your posts went “viral” too with the “viral reach” metric. The viral reach metric shows the number of people that have shared your posts. Top 5 Post Actions: Learn which post has received the most of the likes, shares and comments. Posts Feedback: Have you wondered if your post has been received positively by your audience? This table will help you to know the amount of positive and/or negative feedback that each post has received in different periods of times. 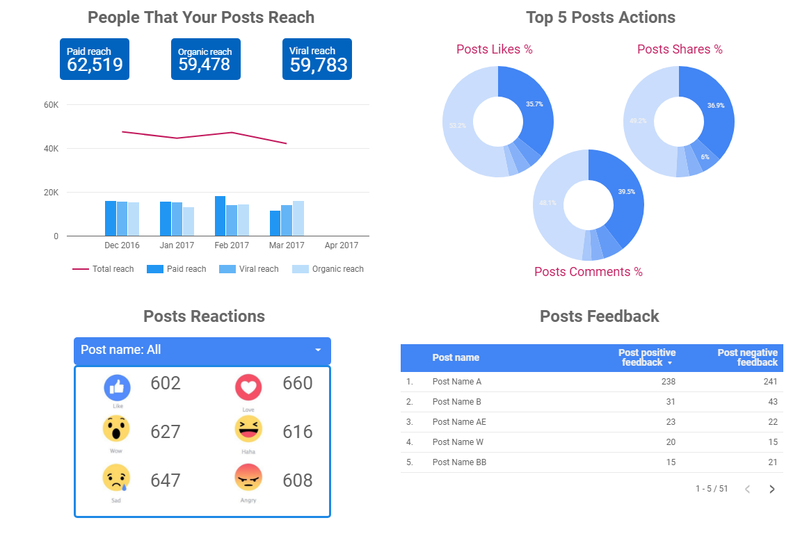 Posts Reactions: Learn the total number of reactions that your posts have gotten. You can filter by post name to learn the specific reactions (like, love, wow, haha, sad or angry) that users have chosen when engaging with your posts. 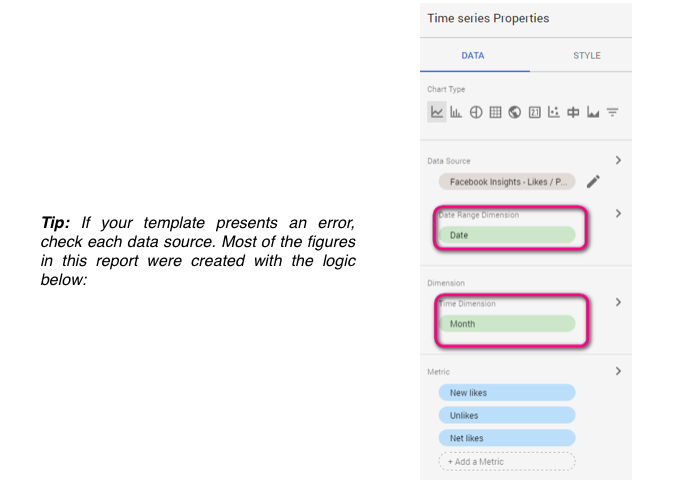 Open a new Google Sheets file and launch Supermetrics and go to the Template Gallery. Go to the custom URL and paste our URL above (this blog can help guide you through the process). Be certain that the metrics have downloaded correctly and that the date range is the one you want to use. Tip: Supermetrics will download the set of monthly data with a “|” between the year and the month, which makes it difficult for Data Studio to read it. One easy way to delete it is to select the complete column and use the function “find” to replace “|” to “ “. Create a copy of our Data Studio report. When adding the data sources, verify that you change the “type of month” metric into “Year Month (YYYMM)”. You can do this in the second phase of adding this data source, or when you have set up the report. We hope that this report will help you in gaining valuable insights for the growth of your Facebook Audience. Feel free to use it and customise it according to your business needs. If this report is helpful, please let us know and we can continue creating even more. Miguel Cedeno works for Coast Digital; a digital marketing agency in the UK. He enjoys helping businesses to connect with their right audience, by using both (paid and social) channels to deliver the right message. Working closely with his clients, Miguel specializes in Paid Per Click, using Data Studio Reporting to create actionable business insights & testing different strategies to reach maximum conversions.